The site was put together upon the occasion of a new exhibition celebrating the 300th anniversary of the construction of the current Chapel, the third successive one in the Palace. 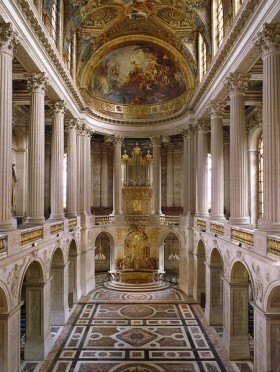 This was built during the waning years of the reign of Louis XIV, the Sun King. This is where many members of the royal family were married, including Archduchess Marie-Antoinette and the Dauphin Louis-Auguste, later Louis XVI. For an evocation of what it was to hear Sunday Mass there before the Revolution, see this post. Prepare to soar, and enjoy!